UNITED NATIONS, February 10 -- With fighting continuing between Cambodia and Thailand, including reported use of cluster bombs, a February 14 meeting of the UN Security Council on the conflict was confirmed Thursday night to Inner City Press by India's Permanent Representative to the UN Hardeep Singh Puri. Indonesia's foreign minister Marty Natalegawa will attend, he said, though only in his “personal capacity.” The meeting will be closed, with no press. Other countries with an interest can attend but not speak. While some Security Council members had hoped that Cambodia could be convinced to withdraw its request for a meeting, this has not happened. In fact, Cambodia's prime minister Hun Sen has accused his Thai counterpart of war crimes. The UN and its Secretary General Ban Ki-moon have had little to say about the fighting on the Thai - Cambodia border, despite UNESCO and the World Heritage designation having fanned the flames of nationalism. Now, not only Indonesia's current foreign minister but previous Thai foreign minister Surin Pitsuwan are touted as a possible replacements of Ban. Why isn't Ban speaking to the Council Monday on this issue? Watch this site. UNITED NATIONS, February 8 -- A day after the UN Security Council did not act on Cambodia's request for a Council meeting, late Tuesday agreement emerged to hold the requested meeting on Monday, February 14. To make clear that the UN is deferring to the regional group ASEAN, its mediator between Thailand and Cambodia Marty Natalegawa will be invited to come and speak. Meanwhile Secretary General Ban Ki-moon told the Press on Tuesday that he had spoken with the prime ministers of Thailand and Cambodia. Some wonder why Ban isn't mediating, or even asked to mediate, under UN Charter Article 99. UN's Ban & Marty Natalegawa: UN replacement? 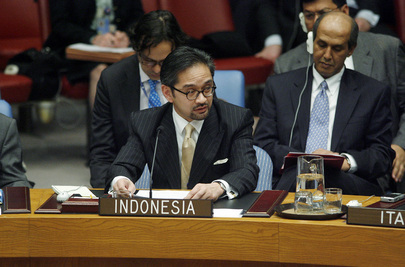 Natalegawa was previously Indonesia's Permanent Representative to the UN, and some now mentioned him for higher, even the highest, UN position. Footnote: also in Council consultations Tuesday, discussion was had of a Council trip to the Middle East. Watch this site. On Thai - Cambodia, UNSC Defers to ASEAN's Natalegawa, UN Replacement? UNITED NATIONS, February 8 -- Despite a request from Cambodia's prime minister Hun Sen for a UN Security Council meeting on the fighting with Thailand, the Council on Monday did not schedule a meeting, deferring instead to the mediation of Indonesia's foreign minister Marty Natalegawa, for ASEAN. Inner City Press, which reported before the Council's consultations on the matter that two countries wanted to hold a meeting, is now told that in the consultations, Russia spoke in favor of having a meeting, saying this is what the Council is for. As Russian Permanent Representative Vitaly Churkin left the Council on Monday, Inner City Press asked him about the Council having a meeting on Cambodia's request. We are not against it, he replied. Inner City Press then asked the Council's president Maria Luiza Ribeiro Viotti if Hun Sen's public request that the UN establish a buffer zone around the Preah Vihear temple. No, she answered, that request had not been made to the Council. Meanwhile, Thailand's prime minister Abhisit Vejjajiva has said he will call UN Secretary General Ban Ki-moon on Tuesday. 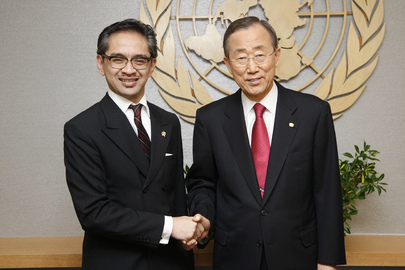 Natalegawa was previously Indonesia's permanent representative to the UN, and knows the system well. His successor on January 31 told Inner City Press that ASEAN led by Indonesia is trying to get Western sanctions on Myanmar lifted, while getting Myanmar to agree to an ASEAN envoy to that country. Some expect Natalegawa to be able to keep the Thai - Cambodia issue off of the Council's formal agenda, by the withdrawal of Cambodia's request just as a similar request was withdrawn in 2008, when Viet Nam was president of the Council. But for now the fighting has continued. A buzz at the UN this week concerns the open dissatisfaction with Ban by several countries, including veto-wielding Security Council member Russia. If Ban were denied a second term, as the US denied one to Boutros-Boutros Ghali, the next five or ten years would be seen as belonging to the Asia group, just as Kofi Annan replaced Boutros for the African group. What higher profile and more adept replacement could there be from the Asia group, some say, than Natalegawa? Watch this site. 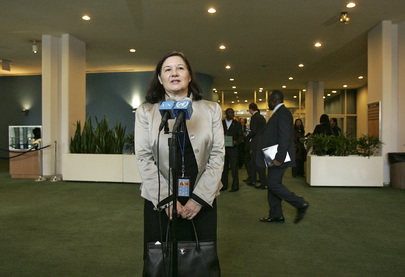 UNITED NATIONS, February 7 -- After Cambodia's prime minister Hun Sen wrote Sunday to the President of the UN Security Council, Brazil's Ambassador Maria Luiza Ribeiro Viotti, she made 14 calls to Council members and the Secretary General's office about the border skirmishes with Thailand. The consensus on Sunday, Inner City Press is told by sources, was to have ASEAN deal with the conflict in the first instance, with Indonesia's foreign minister (and former UN ambassador) taking the lead. On Monday morning, however, something change. With the issue set to be discussed in closed door consultations under Any Other Business, two countries are said to want there to be a formal meeting on Cambodia's requests, which now include a request for UN peacekeepers and a buffer zone. Much discussed on Monday morning at the UN was the last time this border and temple dispute came to the Council, in 2008. Then, with fellow ASEAN member Viet Nam holding the Council presidency, pressure was brought to bear to keep the dispute at the national and regional level. Finally, Viet Nam's Permanent Representative told Inner City Press, “Letter withdrawn.... problem disappear.” But will that happen this time? Perhaps not. Watch this site. As Thai - Cambodia Fighting Escalates, UN & Its Council Unresponsive, Repetition? UNITED NATIONS, February 6 -- As fighting escalates between Thailand and Cambodia, the UN and its Security Council presidency did not answer questions on the matter, even after Cambodia's prime minister Hun Sen wrote to demand an urgent meeting of the Council. 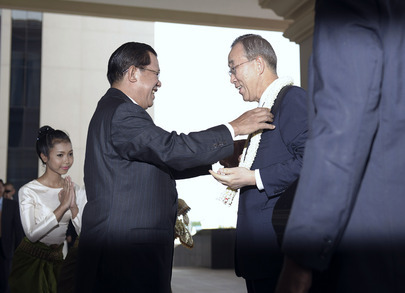 Inner City Press, which had asked Secretary General Ban Ki-moon's spokesmen about the dispute starting February 4, asked the top two listed contacts at the UN Mission of Brazil, this month's Council president, to confirm the receipt and circulation to members of Cambodia's requests. More than 12 hours later, there was no response. Nor to detailed questions to Ban's two two spokesmen. While one would expect the UN to be more responsive, perhaps this disinterest is related to the last time this border and temple dispute came to the Council, in 2008. Then, with fellow ASEAN member Viet Nam holding the Council presidency, pressure was brought to bear to keep the dispute at the national and regional level. Finally, Viet Nam's Permanent Representative told Inner City Press, “Letter withdrawn.... problem disappear.” Will that happen this time? Twelve hours later, there was no response. Watch this site. 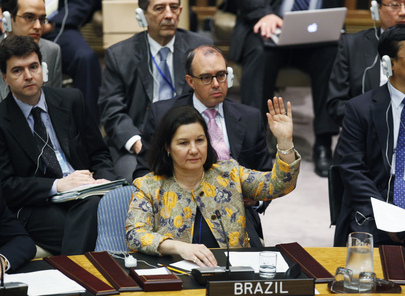 UNITED NATIONS, February 1 -- As protests spread from Egypt to Sudan and even Albania, February's UN Security Council president Brazil undertook Tuesday to meet with each of the Council's members about the month's program of work. Just outside the chamber, Inner City Press asked Ambassadors questions as they emerged, starting with whether Egypt might be considered in the Council, at least in the “horizon” or big-picture briefing by the Department of Political Affairs. Without exception, the Ambassadors said that it would not be considered. “It'll be talked about, but not here around the horseshoe table,” India's Permanent Representative Hardeep Singh Puri said on his way out. On his way in, when Inner City Press asked about the month's “hot topics,” he said that the hot topics would not be dealt with in the Security Council. Some wonder: then why want so badly to be on the Council? The morning began with Bosnia, January's president, passing the torch to Brazil -- or the “hot potato,” as Bosnia's Ivan Barbalic put it to Inner City Press. Next came Russia, with its usual troika of Vitaly Churkin, Konstantin Dolgov and the ubiquitous Vladimir. Asked about the truth of the US pushing additional Cote d'Ivoire sanctions in the Council, Churkin said no, given the African mediation efforts, no new sanctions would be discussed. France's Gerard Araud, next in line, agreed that additional sanctions would not proceed in light of the African mediation -- which includes Chadian president Idriss Deby. 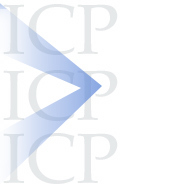 Inner City Press asked Araud -- and UK Deputy Permanent Representative Philip Parham -- about Sudan international justice issues, which will be the subject of a separate story. India's Hardeep Singh Puri said, of Sudan, that there might be one meeting instead of the planned two about the Southern Sudan referendum, and that Brazil's Permanent Representative Ribeiro Viotti-- he called her by her first name Maria Luiza -- would consult, “as a mature member,” and decide. Asked if he envisioned the draft resolution on settlements by Israel being considered, he said on the record that he did not, that leaving it “in blue” for an extended period of time would not be a problem. The next Ambassadors spoke, among other things, about the new report on North Korea: when would the 1718 Committee consider it? It has been circulated, was the response, and will follow the normal procedure. Inner City Press asked for a response to the cynic's view that China will not want the report to proceed anytime soon. “That's a cynic's view,” was the response. The wild card for the month will be the Department of Political Affairs briefing. 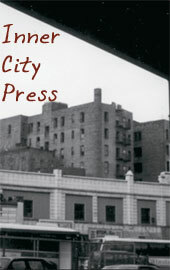 Inner City Press asked if it would include reference to Egypt and Tunisia, even Jordan and Yemen. “Probably not,” came the response. “That is too big picture.” And so it goes in the UN Security Council. UNITED NATIONS, February 1 -- Amid protests by Egyptians in Cairo, New York and elsewhere, the UN Security Council held its end of presidency reception Monday night, hosted by Bosnia in a rooftop space a half dozen blocks from the UN. That Egypt is the big world news but not present in the Security Council, nor meaningfully addressed by the out of town Secretary General Ban Ki-moon was the talk of the night. The UK has been most clear, in statements by David Cameron and foreign minister William Hague: Mubarak is a “friend of Britain” and the prospect of Muslim Brotherhood involvement in a subsequent government is abhorrent. 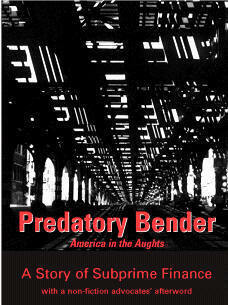 To some it echoes the Cold War: the enemy of my enemy is my friend. For thirty years of “emergency” rule. There were of course other topics. Inner City Press, which reported earlier in the day on attacks in the ECOSOC Committee on NGO on a women's group from Serbia which mentioned discrimination against lesbians in its application for consultative status, asked Serbia's Permanent Representative about the group. He was jovial but hadn't heard of this new Serbian showdown. 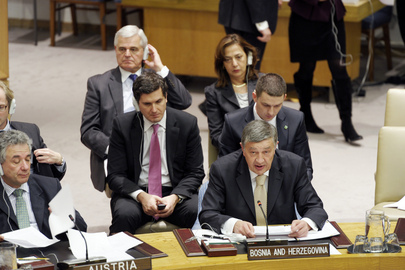 The irony is that after Serbia's lower down representative spoke in favor of the group, so did the US and Bulgaria, as well as Belgium and the EU. On the other side were Pakistan, Russia, Sudan and Morocco. Now that Egyptian regime is on the rocks, despite its long time Permanent Representative trying to act otherwise at the UN on Monday, delivering a speech to the UNDP executive board as if nothing was happening. So while the world sees and talks about a wave of change sweeping the Arab world, this leaves no mark inside the UN, where Arab countries like Morocco score points by opposing gay rights. There was talk of Islamic peacekeeping, with an Asian Muslim country's Permanent Representative telling Inner City Press his country has offered troops to Somalia's Transitional Federal Government if the force ever “gets blue hatted,” or comes under UN command. He said that same of Afghanistan: his country will only send soldiers if the UN is in charge, not ISAF. While several members characterized Bosnia's presidency in January as rather sleepy, its reception got higher marks from the crowd of diplomatic Epicures, noshing on Kobe beef sliders and burek like Bosnian pastry filled with meat and spinach. The Bosnian missions first couple ended the evening by dancing, as the lights of midtown Manhattan flickered through the glass roof. Their Deputy was congenial, having served her country through thick and thin. Inner City Press' question to the Perm Rep about a new documentary about UN peacekeepers in Bosnia buying women -- where was the Autonomous Women's Center then? -- met with a smiling “I'm not working tonight.” But of course he was. And through the course of January he got more accessible and comfortable at the Council stakeout, to his credit, unlike some in the UN. The deterioration under the Ban Ki-moon “regime” as one called it was also in the air. A well placed Council source recalled “Martin [Nesirky] got excluded from the Council's consultations and all we got was a letter from [Vijay] Nambiar.” Ban's chief of staff Nambiar was in attendance Monday, but chief adviser Kim Won-soo did not seem to be. Susan Rice was nowhere to be seen, nor it appeared was her UK counterpart Mark Lyall Grant. The Permanent Representatives of France, China and Russia were all present, along with those of just left Council members like Austria and Turkey. Israel's prime minister is much concerned of regime change in Egypt. Israel's hard line Permanent Representative was not seen at that reception Monday night, but earlier on Monday Israel joined the defense of the Serbian group on lesbian rights. And so it goes at the UN. Footnote: earlier on Monday several dozen UN correspondents discussed the lack of information coming out of Ban Ki-moon's UN, unfavorably comparing Ban's answering in New York to what he does, for example, while in Addis Ababa the last few days, including a France 24 interview against deferring announcing a campaign for a second term. Ban's spokesman Martin Nesirky was reviewed, called alternately rude and “in a tough spot” not getting any information from Ban. We'll address this going forward - later today, and in this new month when Brazil heads the Council, holding a debate on Security and Development on February 11. Watch this site.